Along with tuna pasta the jacket potato is probably the ultimate student food. They're cheap, they're very quick and easy to prepare and they're pretty filling as well. While baked beans and grated cheese is probably the topping that adorns most baked potatoes around the country, there are plenty of other ideas that are just as quick but will add a bit of variety to a weekday dinner. One of the great appeals of jacket potatoes is that they can be ready in a matter of minutes if you cook them in the microwave. While they're spinning around doing their thing, you can rustle up the topping and can pretty much have dinner ready in the ad break of your favourite telly programme. However, if you want the full experience, nothing beats the crispy skin of an oven-baked potato. This does take time but if you're organised you just pop it in the oven about an hour-and-a-half before you want to eat and there's really not much else too it - just a bit of waiting. A good compromise is to cook the potato in the microwave until it's almost cooked through and then pop it in to a preheated oven to finish it off for 30 minutes or so. Whether you're cooking yours in the oven or microwave, always wash the potato first then prick it all over with a fork. For a really crispy skin, you can rub a little oil over it (for oven cooking). This is the classic filling. Heat the baked beans - they work really well if the sauce has been reduced down and the beans have started to go a bit mushy. Grate a good amount of strong cheddar cheese. Split the potato, add some butter then pour over the beans. Sprinkle the cheese over the top and watch it melt into the beans. Delicious. Chilli con carne works really well with jacket potatoes and this is great if you have some in the fridge or freezer. Heat it separately then spoon over the jacket potato. Top with some soured cream. Finely chop half a red onion and half a red pepper then place in a bowl with a drained can of tuna. Mix in some mayonnaise and season with freshly ground black pepper. This makes enough for two potatoes. Melt a little butter in a pan, add a couple of handfuls of chopped mushrooms (a mix of mushrooms is best) and fry until they're soft and cooked through. Drizzle in some single cream and heat through. The cream will soften the potato and the mushrooms taste great. A handful of cooked prawns is all you need for a glamorous topping for your spud. Defrosted, frozen, cooked prawns are ideal for this. Just heat them through thoroughly and mix with a little mayonnaise. A great way to use up leftover curry. Most curries work well as a topping for jackets - just heat through thoroughly and spoon over the potato. Perfect for a summer lunch or snack and there's really nothing for you do apart from open the carton and spoon the coleslaw over your spud. Crispy bacon rashers work really well as a simple topping for baked potatoes. Choose a full-fat cream cheese and don't be shy! Chop some chives and scatter these over the top. Hold back a little of your Bolognese sauce when you're making spag bol. A couple of spoons of this on an oven-baked jacket is sufficient for a tasty meal. These are just a few of the many hundreds of topping ideas for everyone's favourite quick meal. 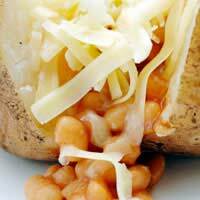 A jacket potato is very nutritious so it's a great fallback when you can't find inspiration or you don't have much time to cook dinner. Please could you add pictures of the goods if possible. In the U.S. we never eat tuna on our baked potatoes!! We add bacon, cheese, sour cream and green onions!! Good for kidswith cheese , beans , mini hot dogs and tuna ?! Buy the dry pasta shapes for kids and then make sauce but blend in veg so it hides it. I know that's not teaching them to taste foods but once they are older they may be a little more willing to try. I do add a little sugar to make mine eat the sauce. You can 'con' them that they are having the tinned rubbish stuff! I have seen bob the builder in the gluten free section recently. please help me, I have 3 very fussy children, 2 of whom will only eat jackets with tuna and the other wont eat them at all.Meal times are simply a nightmare since I have to make different meals for each of them. If only there was a jacket dish they would all eat....heaven! Any ideas? Many thanks.